Mumbai was calling, so we caught the train to Delhi, and spent a night in Nizamuddin West before taking another train to Mumbai. Hazrat Nizamuddin is one of five major railway stations in Delhi, and Nizamuddin West is a well-preserved Old Town. Parts date back tot he 14th century. 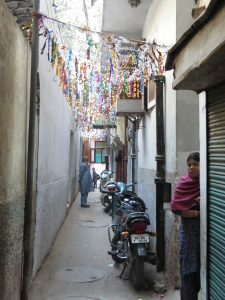 It has the traditional narrow, twisting alleys with no street numbering system. There were also one-way streets and roadblocks. It took us quite some time in the rickshaw to find the hotel. It was late at night when we arrived, so we didn’t have much time or will for exploring. A few doors down the street we found a restaurant that was in the process of closing. We begged a bit of whatever they could provide. It turned out that they had curry left over, and could whip up some hot chappati. After scoffing it in record time, we went back to the hotel to collapse into bed. We were slightly bemused by the strictness with which moral virtue was policed on the premises. 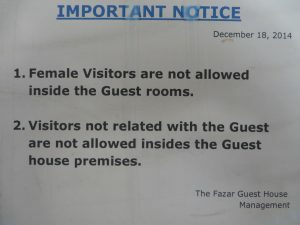 We hadn’t seen anything this strict since the guesthouse in Rishikesh that was part of an ashram! The next day, we had the most of the day to explore the area, as we were taking an overnight train to Mumbai. Even in the big smoke, there were still animals on the streets! This one was as big as a cow, but is actually a goat (the kind with floppy ears). We discovered the just behind our hotel was a historic marble palace/mausoleum, which had recently been restored. It is the final resting place of a famous poet, Mirza Azizah Kokal Tash. 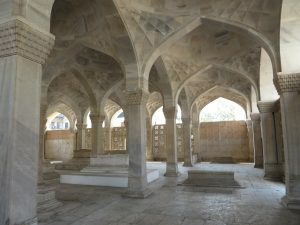 It is known as Chausath Khamba (64 Pillars) because of its design. The 64 pillars (and everything else) are made from white marble. The style is Iranian, with perforated screen panels and arched window spaces letting in lots of light. It was consecrated in 1624. 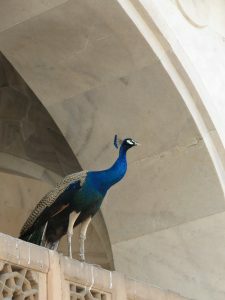 Perfectly complementing the architecture, a wild peacock posed elegantly atop one of the screens so we could get a photo. 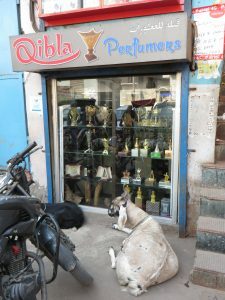 The entrance was guarded by a couple of uniformed chappies who doubled as tour guides, if you slipped them a few rupees. They didn’t really add much information to what was written on the signage about the place, but they knew where to find the signs. And they had the keys to all the gates. We don’t mind making donations to get local information, though. We seemed to make their day by being interested in the monument they were guarding. After lunching and resting in our room, it was time to leave. Among its other quirks, this hotel had a policy that we particularly appreciated – a 24-hour tariff. When you pay for a room, you get to stay 24 hours from the time you check in. We weren’t sure if this was a cultural thing, or just a practical result of being located next to a 24-hour-a day railway station. However, it meant we could have a late afternoon nap in our room before boarding the evening train to Mumbai. 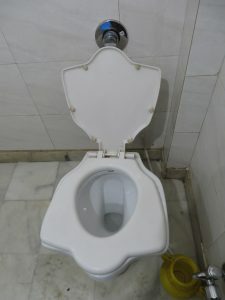 This hotel was also the only place we have seen the genius solution to the squat-vs-sit toilet dilemma which grips much of India and South-East Asia. This (we dubbed it the “tulip toilet”) is a sit toilet you can squat on without damaging it. Sheer genius. In Mumbai, Jenny ran an all-day clinic for the Team Management and Leadership Program on the Saturday. 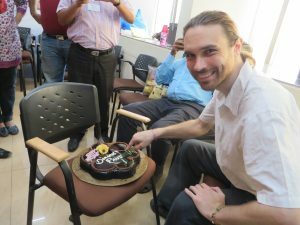 A three-hour clinic for the coaches was moved from Friday night to Sunday morning, throwing a spanner in our plans to do some Mumbai sight-seeing and eat at a nice restaurant for Ravi’s (Tom’s) birthday. 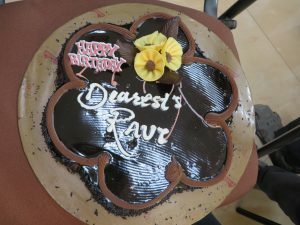 The team came up trumps, though, and morning tea on the Sunday was a surprise birthday party for Ravi. Everyone was very grateful that he chose to come to the clinic and contribute when it was his birthday. After he ceremonially cut the cake, it was divided into pieces, and, of course, he got the best piece. 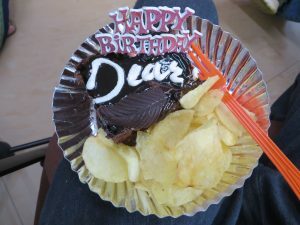 Accompanied by his favourite kind of potato chips (no, nobody had asked – it was a co-incidence). It wasn’t exactly the white linen tablecloth restaurant meal we had been planning, but it seemed to go down just as well! The warmth and enthusiasm of the TMLP in Mumbai will always stay with us. We promised we would be back again soon. We flew out from Mumbai on the evening of the birthday Sunday, heading for Kuala Lumpur to get a Thai visa.